A huge war show commissioned by the BBC. This 8-part series is set in the 12 or 13th century BC, and it shows the 10 year siege of Troy by arch-enemy Sparta. Where can you stream Troy: Fall of a City? 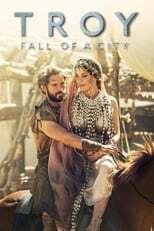 On 2018-02-17 War & Politics/Drama TV Series Troy: Fall of a City first aired on BBC One. Written and created by David Farr, and produced by Wild Mercury & Kudos, Troy: Fall of a City will return and was last broadcasted on 2018-04-07.